This story starts with Steve Bannon and ends with a lawsuit. In the middle is Biosphere 2, a $150 million facility built by eccentric billionaire Ed Bass, which was intended to be a replica of Earth’s own ecological systems. (For clarification, Earth is Biosphere 1.) 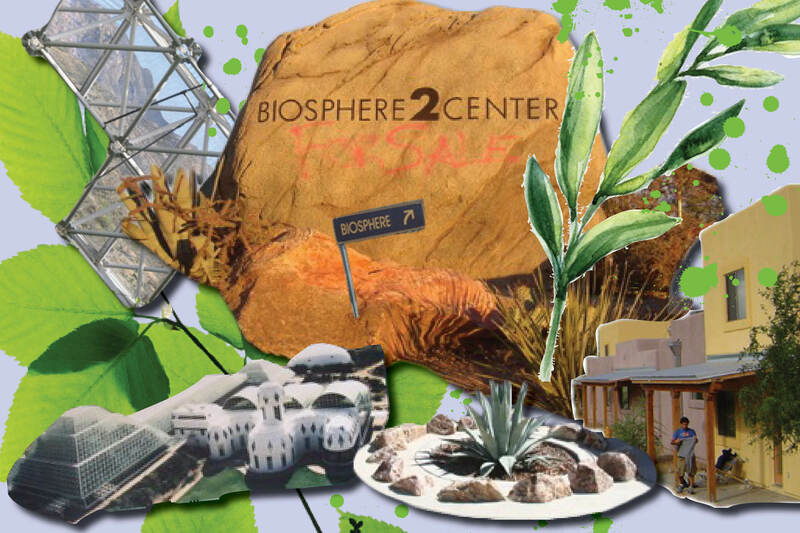 Built in Oracle, Arizona, the Biosphere 2 facility consists of a giant enclosure that is made up of five separate biomes: ocean, savanna, marsh, desert, and rainforest. And between 1996 and 2003 this futuristic, white, honeycombed structure was operated by Columbia. Biosphere 2 has long been the place where the dreams of science and the hubris of moneyed interests have met. Columbia was no exception. The University would invest millions of dollars, relocate faculty, boast of their research, and begin an education program at the Biosphere, all of which would ultimately crumble. The publicization of the Biosphere, whose very name carried years of media frenzy, overstated the capabilities of the facility. The story of the Biosphere is that of big personalities, moneyed interests, research and education, baked in the Arizona sun. The staggering rise and swift fall of the project would instill caution in Columbia’s further endeavors and leave an indelible impact on the University’s scientific history. In 1994, Columbia was just beginning to associate itself with Biosphere 2 by forming a six-month Biosphere 2 Research Group. The Group tentatively began projects at the facility, sending post-docs to Arizona and applying for grants, laying the groundwork for further research. “Our new focus at Biosphere 2 is to give complete access to the world’s top scientists investigating the difficult issues in the management of Earth’s resources and the planning for Earth’s future,” said Stephen K. Bannon in September 1994. He was the acting CEO of Space Biosphere Ventures, which used to be the parent company of the Biosphere 2 project. “This access is an essential first step in taking Biosphere 2 to its full scientific potential.” At this point, Bannon, future climate change denier and executive chairman of Breitbart, was fresh from a stint as an investment banker. This was the Biosphere’s first brush with institutional acceptance, after a long period of media scandal in the early 1990s. A 1991 New York Times article notes the offbeat beginning of Biosphere 2. It was the project of billionaire Edward Bass and his close friend, John Allen, whom Lisa Ruth Rand, Barnard graduate, science historian and Biosphere 2 education program alum, describes as “enthusiastic, self-taught … naturalists.” The goal of the project was much disputed. Allen, the leader of Synergia Ranch, a private “ecovillage,” envisioned the future biospheres to be “refuges for a small elite from nuclear war or other disasters.” Bass himself was outright in admitting his hope to turn the facility into profit. Neither of these goals came to fruition. From the moment of its founding in 1987, Biosphere 2 was fraught with controversy surrounding a status it still struggles to claim today: legitimacy. The Biosphere’s bizarre public history began before Columbia’s involvement. Biosphere 2’s functionality began with “missions,” which sent people to live in this second, self-contained Earth to prove life within it was possible. The first mission in 1991 was staffed by eight bachelor-level scientists and run by Bass and Allen. The mission ended two years later as planned, but was flawed from the start, at least in the eyes of the wider scientific community. Plans for all eight group members to remain sealed within the Biosphere were short-lived, as design flaws in the Biosphere required food and oxygen to be artificially introduced to the structure. According to John Adams, the current deputy director of Biosphere 2, who worked at Biosphere 2 before, during, and after Columbia’s administration of the facility, Columbia had researchers at the facility as early as 1995, when he himself arrived as a research intern. He describes Columbia’s 1996 agreement to manage Biosphere 2 as “more of a formality,” seeing as Columbia researchers were present at Biosphere 2 before the agreement was announced. The agreement in question was for a five year management of Biosphere 2, from 1996 to 2001, by Columbia, specifically by Lamont-Doherty Earth Observatory. John C. Mutter, interim director of Lamont-Doherty at the time of the agreement, was a dissenting voice in the discussions that brought Columbia and the Biosphere together, expressing a distrust in the untested facility. The exact details of this agreement are hard to find, but a Columbia press release from the time of the announcement stated that, “the operations of Biosphere 2 … will be integrated into the institutional science and education missions of Columbia.” Indeed, starting in 1996, Columbia would invest between $25 and $30 million in Biosphere 2. The press release details Columbia’s goals in grand terms. It pledges “to create an unprecedented laboratory that will attract scientists from around the world.” It promises patents and environmental science semesters for undergraduates. 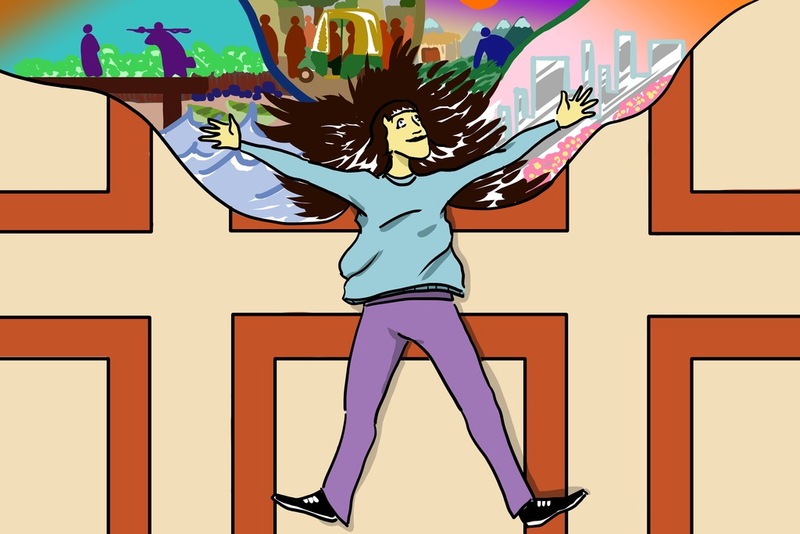 Of these pledges made, only the last—to offer semester abroad opportunities to students—was moderately successful. Even in this regard, the education program was riddled with recruitment and leadership issues. The sheer physical distance from Columbia, combined with the planned scale of the program, created a gap between expectation and reality. The education program made Biosphere 2 part of Columbia’s academic purview, attaching the heavy name of Columbia’s academics to a green program. The summer before Columbia launched its undergraduate education program at Biosphere 2, a young researcher by the name of Debbie Colodner was hired as its education director. Michael Crow, then executive vice provost of the University and current president of Arizona State University, was the program’s originator. “There was a lot of freedom,” Colodner, now director of conservation education and science at the Arizona Sonora Desert Museum, recalls. The ultimate goal for Colodner and the handful of faculty hired alongside her was to create a curriculum that could “teach about the earth system in an integrated way.” Originally the program was just that: a semester of environmental science coursework called the Earth Semester. The program was open both to Columbia undergraduates as a chance to “study abroad” and to non-Columbia students. Per the archives, in 1999, a second program called the Universe Semester, which focused on astrophysics and astronomy, was introduced and ran alongside the Earth Semester. “It was this almost idyllic, sort of paradise kind of space,” Rhiannon Bettivia, a member of the Barnard Class of 2005 who took part in the Universe Semester at Biosphere 2 in 2003, says. 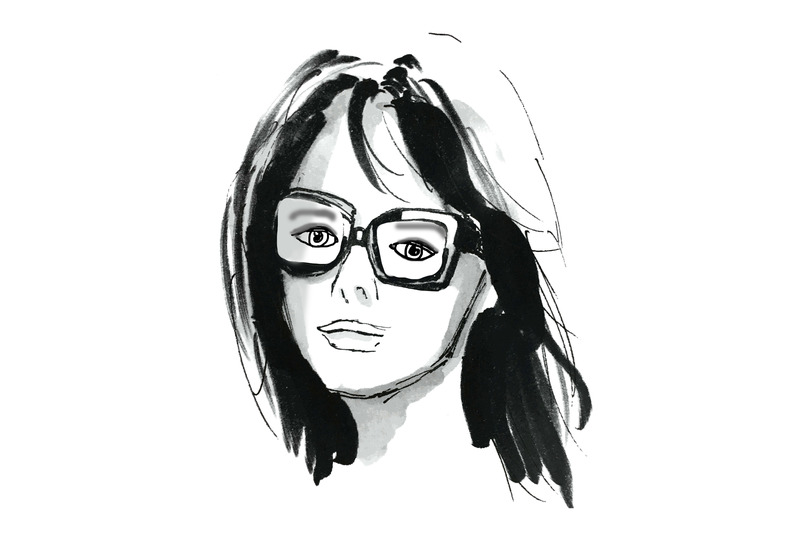 She majored in philosophy at Barnard but took many astrophysics courses. Her entire semester was filled with astrophysics coursework not offered at Columbia at the time. For her, as well as for Rand, who was there concurrently, the Universe Semester was more than they could have imagined. The students lived in casitas, small houses outside the structure that seemed enormous in comparison to Columbia dorms. Bettivia describes the housing in vivid detail: four to five rooms, a large kitchen, an open space, back patios overlooking the desert, classrooms downstairs, and a telescope one flight above. The program was split into three to four week modules. Ann Holmes, today a professor of geology at the University of Tennessee, Chattanooga, was one of the faculty chosen to work as full-time teachers at Biosphere 2. She was an integral part of module design in the summer preceding the first students’ arrival. She tells me of the program’s interdisciplinary focus, with modules revolving around a variety of sciences from biology to geology, as well as a level of policy and fieldwork that is unusual for an undergraduate program. Rand, Bettivia, and Holmes all describe a variety of fieldwork outside of the confines of Biosphere 2. The students went to the Grand Canyon with a geologist. They went to Western Water Company to discuss the ways “water is brought in through the Central Arizona Project from the Colorado River.” When Bettivia couldn’t fly home for Thanksgiving, she accompanied a professor to Mexico to do National Science Foundation-funded fieldwork in bird migratory studies. Bettivia and Rand also emphasize the willingness of internal faculty to allow them to do research as undergraduates. Despite their academic focus in astrophysics, both worked within the Biosphere 2 enclosure on primarily biological work. Rand did research on soil fungi in the greenhouses. Bettivia worked in the fog desert with succulents. “I was given complete control of that biome,” she elaborates. “I had full, 24-hour security clearance, to go in and out on my own. I was one of the only students who did.” The ability to conduct research independently in the Biosphere was, and is, rare compared to the average university. “It was amazing to me that they were so generous with their time and their equipment,” Bettivia says. While students fondly remember just how student-focused this experience was, Holmes has a different take: “I was exhausted.” As one of the few faculty willing to go on the field trips, she grew tired of the cycle: on the road for a few weeks, back at the Biosphere, then back on the road. But for the University, the enrollment in the program wasn’t enough to make the Biosphere financially tenable. They “envisioned hundreds of students,” in the program, Holmes says. “They were asking the impossible.” A university press release detailed a “master plan” to bring enrollment up to 300 to 350 students by 2003, the very year Rand and Bettivia came to the Biosphere. That semester, enrollment was 56 students; since enrollment to the program was open to other universities, only 20 of these students were from Columbia and Barnard. This was nowhere near their goals. But with few faculty and a curriculum designed for only 40 students, an increase in enrollment would come at the risk of losing the smaller, close relationships between students and faculty. Colodner expands on this: “There was understandable pressure or goal setting to be able to make this program sustainable financially as well.” Retrospectively, she believes that making both the education program and the research program sustainable would have required an endowment, as it is “very hard to run an education program that pays for itself.” Colodner points out that there were a few areas in which the education programs could have used University assistance, like in recruitment and evaluation. On their own, they were “so inexperienced we didn’t even know to ask.” When the faculty did ask for assistance, she says, help was “variable,” though she emphasizes that administrators in Arizona advocated for the Biosphere 2 education program back at the Morningside campus. With the education facing its own administrative questions, the research program staggered. “It wasn’t built to do research,” Colodner says. This echoes concerns expressed by John Mutter, the former Lamont-Doherty affiliate. Spectator quoted him as being “skeptical about affiliating with an ‘unproven facility,’” concerned specifically with the lack of research in Biosphere 2’s past. Today, Mutter reveals that the research side of Biosphere 2 had a myriad of problems, known from the start of Columbia’s advising with the facility in the 1990s. The structure itself, while unprecedented, had no outside control with which to compare results found within. The positioning of the biomes, while aesthetically interesting, was entirely unpractical. “The ecosystems in there, interacting with one another, would never interact with one another in nature,” he says. Additionally, the soil within the structure was locally sourced, a far cry from the nutrient unique soils of an actual desert or savannah. Meetings that Mutter attended were held at the Biosphere to discuss these questions. These meetings gave rise to an agreement to modify the structure, breaking it down into separate chambers to allow for a control and an experimental section. Both Bass and Columbia invested in these modifications, running an experiment to test the validity of the adjustments. There were high costs involved in modifying the Biosphere, which was structurally unique. But concerns persisted. As did Columbia. Columbia’s research at Biosphere 2 was slower than anticipated. Columbia sought major granting agencies to alleviate their own costs but was unsuccessful. This is in part owing to the lack of a scientific community already at the Biosphere, and in part due to the sheer cost of running experiments in the Biosphere. As Discover Magazine notes, the larger research organizations were hesitant to give grants to unstable projects because, “like dog feces on a shoe, [Biosphere 2] seemed to carry a whiff of something the big grantors did not want in their portfolios.” The very history Bass tried to put behind him continued to follow Columbia. While Volvo, the car company, and the Department of Education made high profile contributions to the Biosphere 2 research, these were not enough to sustain the facility or the research hopes of the University. This is not to say that all the research at Biosphere 2 was insignificant or unsuccessful. On the contrary, work done by Christopher Langdon during Columbia’s Biosphere 2 tenure was the first confirmation that CO2 was increasing the acidity of the ocean, leading to less coral growth, a landmark research discovery that factors into our debates about climate change today. Curiously, the administration seems to have recognized this. When it was announced that Columbia would extend their relationship with Biosphere 2, Michael Crow optimistically told the journal Nature, “It took us two years longer than we hoped, but we have turned the corner scientifically.” This was not so. 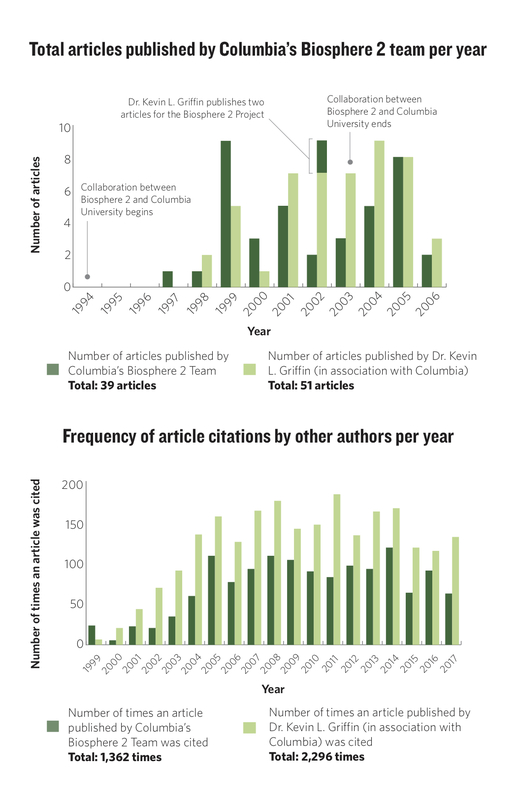 While the University may pride itself on the handful of landmark contributions coming out of the Biosphere, the Web of Knowledge, a citation indexing service, indicates that less than 40 publications came out of Columbia’s research at the structure, with many coming out after the University had severed its relationship. As a standard of comparison, a Lamont researcher named Dr. Kevin Lee Griffin was selected, and his citations, declared grants, and total number of articles were found. He published two articles at the Biosphere, but over the same period of time as the Columbia/Biosphere research program, published 51 articles, which between 1999 and 2017 were cited 2,296 times. His research costs, taken from his declared grants, totaled $3,658,480 between 1994 and 2003. Columbia, in contrast, spent between $20 and 30 million dollars on research and teaching at the Biosphere. This resulted in 39 articles, cited 1,362 times between 1999 and 2003 by other authors. The education program was not sustainable. The research, which Mutter claims was worked on by “at most 10” researchers, had significantly less output. For clarification, the methodology for determining this data was as follows. Biosphere 2 was searched in the topic field of Web of Knowledge, and results were refined to include articles between 1994 and 2006, assuming drafts of articles submitted at the end of the Columbia Biosphere relationship may have taken a year or more to be published. Articles were excluded if the article did not include any actual research at the Biosphere, or was an overview article of past research. 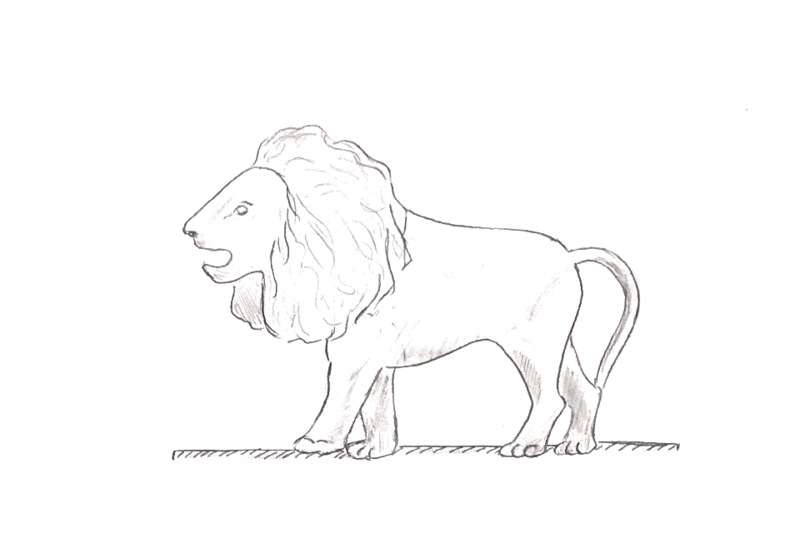 To the best of our ability, we determined that there were 39 articles published. Between 1999 and 2017, these 39 articles were cited 1,362 times by other authors. Information related to Dr. Kevin Lee Griffith’s citations were found on the Web of Knowledge. Information on his grant awards between 1994 and 2003 were found on the Lahmont Doherty Earth Observatory website and reported on his CV. Overlapping information was removed. At least one grant was in a foreign currency, which was computed into the U.S dollar value using the average exchange rate of the year, and may not be precise. Despite the clear downsides to the Biosphere 2 project, President George Rupp and the Columbia trustees had extended the University’s contract with Biosphere 2 until 2005, which would be a total of 10 years, vowing $20 million more for teaching and research in that time frame. The confusing decision to continue with the project underlines a recurring theme in Columbia’s time at Biosphere 2: funding a costly project in spite of its lack of promise. Holmes says that “it was starting to get really dysfunctional in the administration” when she departed for the University of Tennessee. Those who remained at Biosphere 2 communicated to her that “things were not going well.” As far as the administration was concerned, “it was sort of a revolving door [at] the top,” Holmes remembers. “[With] the lead people at Biosphere, [there was never any continuity.” In Colodner’s five years as education director, she had three separate bosses. Michael Crow was once the “champion" of the Biosphere 2 project. With his departure for ASU, so too departed the Biosphere 2’s main advocate within the Columbia administration. In January 2003, the University finally began to react to the invalidity of the project. The University halted plans to install new faculty and moved a master’s in environmental public policy program, once housed at Biosphere 2, back to New York. Mutter admits to a level of impracticality in even having a policy program, which requires no fieldwork, moved from its home in Morningside Heights to Arizona. The New York Times article that appears to have broken the story notes the inherent contradiction in this choice: that Columbia was expressing doubts about the viability of Biosphere 2 only three years after renewing their commitment to the Biosphere. The decision was preceded by what Bettivia and Rand both say were years of rumors about Columbia’s dissatisfaction with the facility. Panels by the University and by independent entities confirmed some of these rumors. The research was not sufficient to justify costs. Outside resources from the Department of Energy and Volvo were not enough to buoy research. The undergraduate students could not make up the difference. Columbia had found itself oversubscribed and contractually sealed in. In September 2003, around the time of Bettivia and Lisa Ruth Rand’s arrival in Arizona, Columbia confirmed that it would permanently sever its relationship with Biosphere 2. As many of the sources, including Mutter, suggested, a change in administration from President George Rupp to President Lee Bollinger lent itself heavily to the decision to halt funding. Before the relationship went sour, Mutter states, Bollinger visited the Biosphere. He recalls Bollinger expressing distaste for the facility. Bollinger reportedly declared, “If you get a degree from Columbia, you go to Columbia, you don’t go to Arizona.” With research that was decent but not groundbreaking, an education program that was considered substandard and characterized by low enrollment, and his advisors reflecting his own doubts, Columbia could no longer hold onto the Biosphere. Bollinger would not put the Columbia crown on something not up to the University’s standards. With the news of Columbia breaking contract, Rand and Bettivia’s idyllic start to the semester took a turn. “We started our term with this kind of very macabre sense of fatalism,” Rand details. Adding to the mystery was the swift response from Bass, who installed armed guards on the facility after the decision to pull out was made. He was, in many ways, protecting his property—after all, mismanagement and damage were hardly a new story with the Biosphere. Neither of the women recalled Columbia making any announcement to the students. They knew it was the last semester. Bettivia saw the armed guards. With the finality of their semester dawning on them, the students at the Biosphere had some fun. The students said a bold, youthful goodbye to the facility. In March of 2003, the Decisions Investment Corporation that owned the Biosphere would sue the University. The University, the lawsuit alleged, was in breach of contract with the DIC. The lack of the once promised, still unbuilt laboratory, the failure to hire additional research faculty, and the “abandonment of ‘off site educational programs’” were all presented as proof of Columbia’s failings. The University, along with a second management group, Biosphere 2 Center Inc., would settle out of court. The relationship formally ended, quietly, on December 22, 2003, as the last students left for home. The University spent between $25 and $30 million on Biosphere 2. The few projects still running would halt. The great monument to science and dogged, moneyed ambition would sit, unoccupied, for four years after Columbia left. In that time, developers would posit wild plans for the facility, from luxury accommodations to a niche retirement home. None of these came to fruition. Instead, Ed Bass donated Biosphere 2 in full to the University of Arizona, which has controlled it for the past ten years. It has been ten years since the new owners gained possession of the Biosphere 2, the same length of time Columbia was supposed to have managed the facility for. It has been 26 years since the facility first opened. When Mutter reflects on the legacy of Biosphere 2, he is blunt but honest. Have fun leafing through our first issue, and subscribe to our weekly newsletter, As We See It!